Trying to find out if this attractively-presented Hindemith recital was likely to be part of a ‘complete piano music of’ I visited the CPO (JPC) site, and was intrigued to see under the “Suitably for this we recommend to you also” listing three unexpected names: Johann Friedrich Fasch (1688-1758), Carl Davidoff (1838-1889), and Samuel Scheidt (1587-1654). Quite how this distinguished trio’s style and idiom relate to that of Paul Hindemith I’m not sure: such things do however keep your lonely reviewer chuckling mildly in the depths of the night. Born in 1975, Christian Seibert is alas way past the ‘young talent’ stage of his career. Turn on the radio in Holland these days and you are lucky if the titanic Liszt Sonata you are hearing has been played by anyone beyond their teens, or so it seems. Seibert has a wide range, performing not only as a soloist, but with orchestras and for a great deal of the time as a chamber music pianist, something which I always consider gives added value to a player’s breadth of view in all aspects of music-making. Seibert’s Hindemith is in no way underplayed, his opening Tanzstücke might arguably even be considered a little on the brash side, but with his subtle voicings and sensitivity to dynamics you can sometimes almost imagine a pair of string players creeping in unnoticed from the wings, and creating a whole new set of pieces. Hindemith’s Tanzstücke are a mixture of elements, mostly quite pithy, with only the central ‘Moderately fast’ having some of that Martinů-like jazz feel. The 1920s dance music is present in a kind of parody at times, but Hindemith’s serious character means that works employ what Alexander Saier calls “the sonerous-rhythmic contrast effect” in his booklet notes for the CD. Christian Seibert adopts this earnest sensibility, but the music takes off from the start with punchy articulation and some rousing pianism which could in the opening ‘Mässig schnell’ easily take on a feeling of aversion therapy, but which ultimately turns into a convincing dance with more than a little Bartók in its blood. The same is true of the lively second piece, with parallel intervals and some rhythmic and harmonic tricks which keep the listener guessing to the end. Seibert keeps us on our toes with plenty of emphasis on the nervy character of these pieces. Shostakovich’s Preludes sometimes spring to mind, even Stravinsky in the fifth work. The fourth piece, Pantomime however creates the effect of variations, elaborating on themes from the other dances and pointing out the theatricality of Hindemith’s approach to these and other piano works – something which crops up again in the 3rd Sonata. In einer Nacht bears the romantic subtitle ‘Dream and Experiences’ and might be expected to possess a certain amount of sentimentality. Indeed, its quiet opening and references to opera make a welcome contrast to the driving energy of the Tanzstücke. 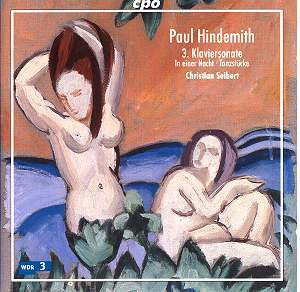 While Hindemith adopts an impressionistic persona in terms of atmosphere, there is no sense in which pianistic display fills in details which can, and are, left to the imagination. This ‘essence of’ sometimes does have a Debussy-like nature, but in those quieter moods. Christian Seibert shows his ability to paint pictures in subtle shades, and the ‘still’ movements have a dreamlike quality while at the same time avoiding static numbness. Short, sketch-like movements such as Nervosität and the Scherzo flit like moths around a bright lamp. I can’t help feeling Messiaen must have come across the Kuckuck und Uhu movement, which is followed by a disarming waltz-like ‘Menuett’ which could fairly easily have been shoehorned into the film ‘Diva’. These piano pieces are a collection of gems which add up to more than the sum of their parts, and Seibert is more than capable of taking the longer view, creating a kind of bizarre suite which climaxes convincingly with an ebulliently anti-Nazi Foxtrott and the final Doppelfuge, Hindemith’s final intellectual stamp of valediction on themes both musical and psychological in this fascinating work. All of Hindemith’s three piano sonatas date from 1936, and the third, laid out in four movements, would appear to have the greatest claim to having a neoclassical character. The first movement is marked ruhig bewegt, with a gently rocking Italianate siciliano nature in 6/8 or 9/8 rhythm. This broken-lyrical mood carries through to the central movements, the second sehr lebhaft being full of rhythmic energy, the third having the feel of a slow march, as well as being a kind of transition to the final Fuga. Glenn Gould recorded this sonata in 1967, and I love his commentary about the “gaffe” of introducing the third subject of the fugue into the third movement: “It is a lapse that attests not only to his fondness for contrapuntal mischief but to his not-infrequent miscalculations in stage-management – the miscalculation is not inherently musical but theatrical.” This kind of intellectual nit-picking doesn’t make too much difference in the grand scheme of things; you will either like this music or not – which boils down to whether you like Hindemith or not, as this is typical and essential Hindemith. What Gould also points out as a weakness is however strongly apparent in some parts of this music, and that is a tendency to ‘splice’ musical ideas in a fairly vertical and abrupt fashion – again, something we all know and tolerate in other composers like Prokofiev, and there is no doubt about the strength of the musical ideas in this particular sonata. CPO’s recording is truly excellent, with both brilliance and full dynamic range in the piano sound – Seibert’s full tone and detailed and refined technique being given every chance to develop, as if one were listening in an ideal concert situation. There are a few other Hindemith piano discs around: Hans Petermandl on Marco Polo, and Kalle Randalu on MDG to pick out a pair of reasonably recent examples, and there is of course Glenn Gould on Sony, if you like Glenn Gould. With only this disc’s relative brevity as a minor quibble, I can only hope that Christian Seibert is given the chance to add to this impressive disc and create a complete Hindemith edition – I for one would be at the front of the queue.